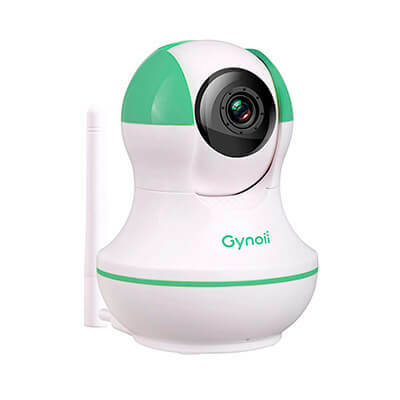 If you want to be able to catch every moment of your infant’s activities when you’re not in the same room as him or her, then the Gynoii WiFi Video Baby Monitor is the ideal monitor for you. It features extremely advanced technology and can even be used as an option for doing video surveillance, that’s how sophisticated it is. Now you might be pondering how can a baby monitor be that advanced? Well, to find out, keep your attention here because this piece of writing is going to provide an in-depth evaluation of this baby monitor selection. As its name conveniently indicates, this child monitor transmits its video and sound feed via WiFi so you can observe what your little tyke is doing using any type of mobile device. Yes, you read that right! You can actually watch your child just by downloading an app on your Apple iPhone, Android mobile phone, or your iPad or tablet. The Gynoii WiFi Video Baby Monitor has a long list of features, which are the main reason it’s such an advanced system. Small, slim camera and base. The camera has day and night vision. Weighs 12.8 ounces with dimensions at 6 x 2.6 x 5.2 inches. Video and audio is transmitted via WiFi to any iOS or Android device, resulting in super clear video and sound. Time-lapse video option up to a maximum of 160 minutes that can be condensed down into 40 seconds. The capability to capture photos, snapshots, and even video clips that can be shared on social networks such as Twitter, Instagram, Facebook, and Google+. Can be used by different users all at the same time. Set-up time of just one minute. Given that this WiFi monitoring unit made by Gynoii has a long list of features, what results is an even long list of benefits for moms and dads and anyone else who decides to use it to watch their child. Having the ability to watch your son or daughter at any possible time from any possible location. If you want to make sure your infant is sleeping sound, you can just roll over and turn on your phone to do it. Or, if you’re on a business trip and the nanny is watching your son or daughter, you can see what everyone is up to by powering up your tablet when you’re in the airport or on the road. Being able to take photos and video clips makes it tremendously effortless to share memories with family and friends via popular social networks. Two-way talk capabilities allow mom, dad, grandma, grandpa, or caregiver to appease a youngster without having to actually be in the room. With its music and lullaby playing capabilities, offering background noise to help a child nap and sleep is convenient and easy. Its time lapse option allows a user to see exactly what’s going on with your child, which also makes it a great choice for watching what caregivers and babysitters are doing when taking care of your little one. Easy set-up means more time with, or watching, your son or daughter. All consumer products on the open market have their own positive and negatives traits associated with them and the Gynoii WiFi video baby monitor is no exception to that rule. Gives a mom, dad, grandparent, or babysitter the freedom to do other things around the house since it’s a portable, convenient monitoring option. Decently priced and very secure. The system’s camera can be placed pretty much anywhere because it’s compact and doesn’t weigh a lot. Picks up sound very well. If your WiFi should happen to go down, the unit doesn’t work so you’ll need to have some sort of backup. The camera itself doesn’t have a pan or tilt feature, which means sometimes your view of your child can be limited. Typically, baby monitors are used by parents to observe what their children are doing when they’re not able to be in the same room as them like when it’s bedtime or naptime. Because baby monitors are primarily used by parents, we thought it would be a good idea to learn about what they had to say about it. Everyone loved how taking photos, screenshots, and videos was an option, so, they could share all the happenings of their little ones. Most said that the set-up did, in fact, take only a short amount of time and liked that they could access the video feed via their smart devices. A few people made the comment that the talk-back feature sometimes had issues and that the sound was off compared to the video they were seeing on the screen. The day and night vision features were a bit hit among the parents. The sound and motion alerts were something parents found to be helpful, especially at night. A lot of parents thought that for the price, finding a monitor that was better wasn’t a possibility. Now that you’ve read this piece of writing that provided an in-depth evaluation on the Gynoii WiFi Video Baby Monitor, you’ve been able to see for yourself why it’s such an advanced child monitoring selection. So, if you’re in need of a monitor to keep track of your little one and think that it will nicely match your needs, avoid a walk-in retail store and buy one online. You’ll be super glad you did when your purchase is shipped conveniently to you, saving you time, energy, and money if you find it at a great price.